In this one elegant electric razor you can take care of a host of personal grooming needs. Four different heads pop on and off the power unit: A general shaver, best for shaving your legs. A smaller precision shaver, good for following the curves under your arms or shaving your bikini area. A precision bikini trimmer for sideburns or shaping your bikini line. A facial cleansing brush for gentle and thorough spa-quality skin cleansing. The power unit and heads are all waterproof and fully immersible. 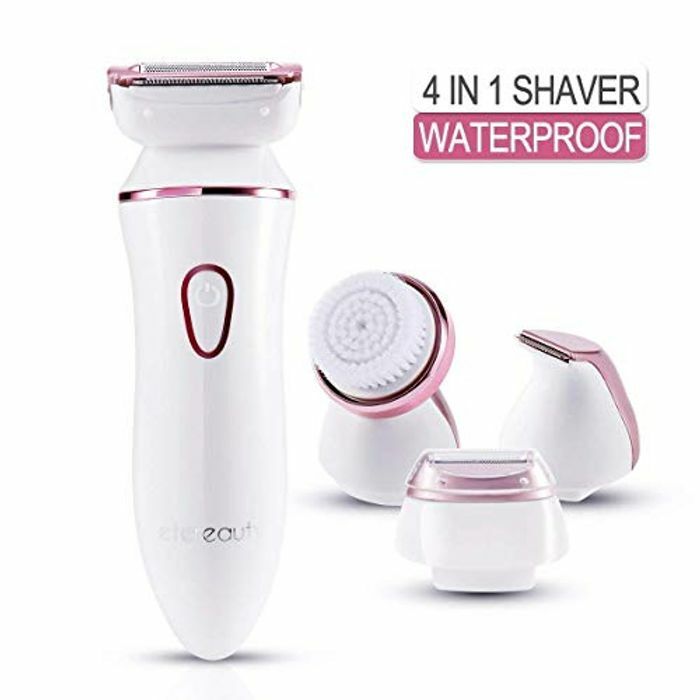 So you can choose either the quick convenience of a dry shave or the comfort and luxury of using the shaver in the bath or shower with your favorite shaving foam or gel. And of course, being fully immersible makes it easy to clean this item under the tap after use. If you've never used a powered facial cleansing brush before, you're in for a treat. The fine, soft bristles of the cleansing brush give you a gentle but deep pore-cleaning and exfoliating wash, leaving your skin feeling fresh and invigorated. Supports two ways of charging. Charging base and charging cable. Charging for eight hours can be used for 120 minutes. There are no batteries to replace.